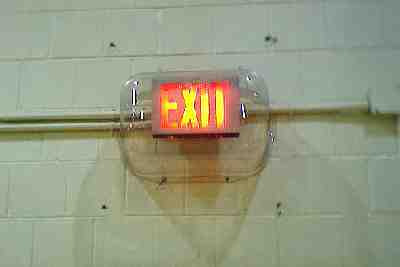 Vandal resistant plastic covers for exit signs are becoming popular for our Local Government Gymnasiums. Has anyone else ever installed these.? Sounds overpriced to me. But, whAt does it cost to replace/repair existing signs? If vandalism is a problem, might be worth the high price. If only a few signs are being damaged, it might actually be less expensive to replace the sign. I've seen similar installations for fire alarm pull stations, & they don't cost near as much. We have approx. twenty Gymnasiums. Vandalism / abuse is a factor. We usually replace damaged exit signs with an L.E.D.type for $59.00 which is more expensive than standard compact fluorescent type. We also consider the cost of Journeyman Electrician labor rate. The same size plastic cover is also used for emergency lighting units in Gym. We just started to use these covers in several of our Gymnasiums to see how they hold up. I guess since they're lit so nice, an exit sign does make an irresistable target for a basketball. Your use of LED type exit signs is the right choice. When I show my customers the savings in power company charges, they are convinced. After all, they're a 24/7 load & even a small load adds up. The old incandescent ones will probably become museum pieces pretty soon. Add to that the bulb and Labor charges/time involved in frequent changes and there's no contest. That would be a real pain to open up every month to change bulbs if they were the old incandesant type.